"For many veterans of Chernobyl, serving as a liquidator was the most important moment of our lives." Liquidator Oleg Veklenko is a founder of 4th Blok, graphic designers who seek to solve environmental problems through art. His own artwork continues to reflect memories of his time in Chernobyl. Original caption: .Photo title:.Oleg Veklenko in his studio..Caption:.Over the course of five years after the accident, some 850,000 soldiers, conscripts and volunteers from across the Soviet Union worked as liquidators, dismantling and burying entire contaminated villages. At the accident site, many braved intense exposure to radioactive debris, in order to remove and bury it...Oleg Veklenko is now a professor of graphic design. 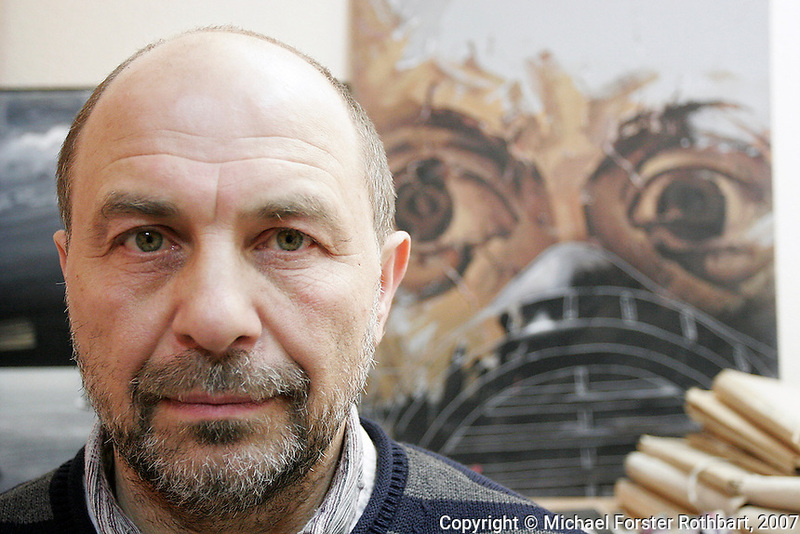 His artwork continues to reflect environmental themes and memories of his time in Chernobyl. ..Quote: . "For many veterans of Chernobyl, serving as a liquidator was the most important moment of our lives." .-- Oleg Veklenko, graphic designer .-------------------.